I'm getting the wiring harness back on my bike, and either failed to label all of the wires, or some of the labels came off. There a 3 green wires with spade connectors at the front of the wiring harness that share the same opening as a black and a brown wire, and the turn signal wires. 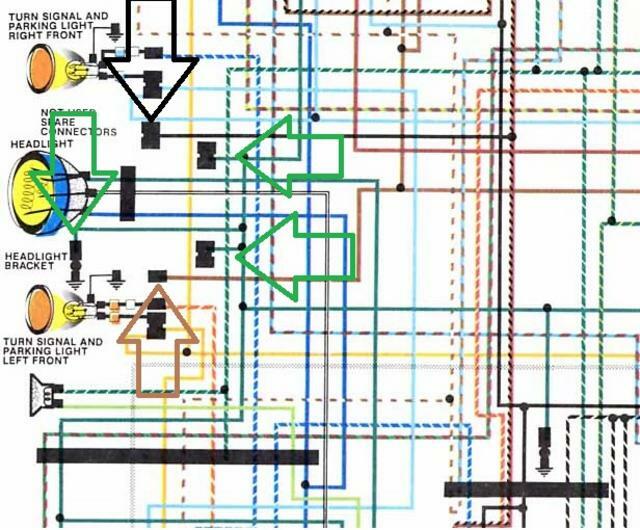 Can someone tell me where the green(ground) wires go, I'm at a loss. I believe these would have been tucked into the headlight bucket. Cheers. Here are the wires that share the same opening in the harness. I believe the brown and black wires were not connected to anything. Two of the ground wires appear to have 6.3mm female spade terminals, while the third ground has a 4mm female spade terminal. 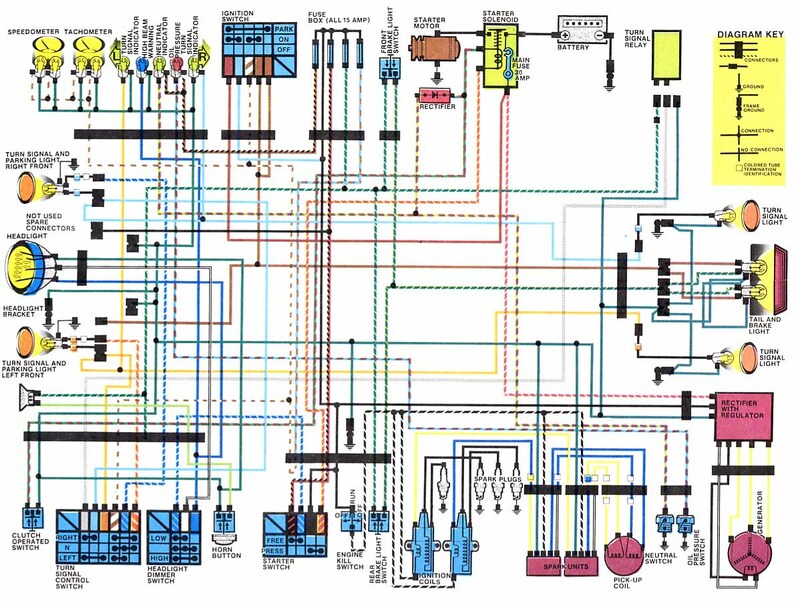 After looking at Old Man Honda's wiring diagram http://oldmanhonda.com/MC/WiringDiagrams/CB650SC.jpg, it appears that they are in fact empty connections along with the brown and black wires. This is good news for me since I'm adding 2 wire aftermarket turn signals, I could use one of the grounds. It also helps with my new headlight since it has a second bulb that will also need power and ground. I'm clearly winging it, ff someone who knows a bit about wiring could weigh in, I would appreciate it. The black and brown are both hot wires. Greens are grounds. The Nighthawk may have an extra green, or the one that plugs into the tab inside the headlight bucket may have come undone. Thanks Folsom, amazingly enough I was reading the diagram correctly. Since my new head light bucket doesn't have a tab, I'll direct wire the to the green/ground that went to the tab in the OEM bucket. Looks like the other two ground wires are free and clear to wire to the new turn signals and gauges. This is good news. I'm not a wiring expert, so I opened the headlight can on my 1982 cb650 (totally stock barn find), and the 2 green, 1 black and 1 brown wire(s) are not connected to anything....Everything works on the bike, so I'll assume the other posts are correct. good luck. 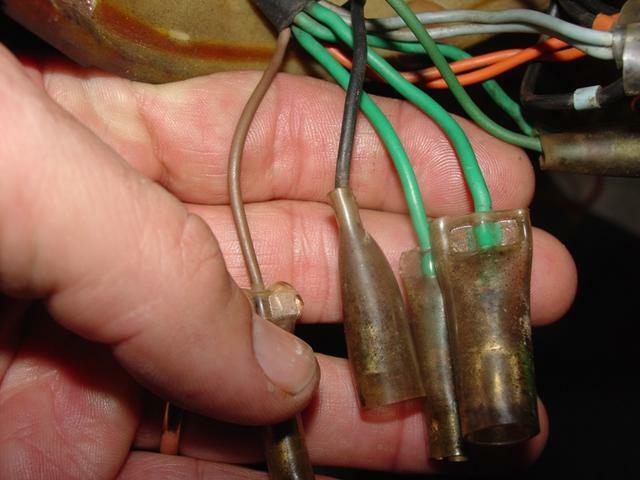 Tommysparta wrote: I'm not a wiring expert, so I opened the headlight can on my 1982 cb650 (totally stock barn find), and the 2 green, 1 black and 1 brown wire(s) are not connected to anything....Everything works on the bike, so I'll assume the other posts are correct. good luck. That's what I was hoping for, thanks for confirming.